Most of us were not taught in school that your choice of words will have an effect on my life. That our thoughts are creative, that they can literally shape our destiny, or that what comes out verbally will return to us as life experiences. Many of us were not taught that we are worth loving or that we deserved to have good things happen to us. And unfortunately, its not common to teach our kids that life is here to support them!! One of the most important things we can do for our children is to remind them of the basic truth that they are lovable. Our role as parents is not to be perfect, to get everything right, but to be loving and kind. Children today have a lot more issues to deal with than we did when we were their age. They are steadily barraged with news about the critical state of the world and are continually having to make complex choices. How children handle these challenges is a direct reflection of how they truly feel about themselves. The more children love and respect themselves, the easier it will be for them to make the right choices in life. It is important that we instill in our children a sense of independence and power and the knowledge that they can make a difference in today’s world. Above all, it is important to teach them to love who they are and to know that they are good enough no matter what. Ask the child what they’re happy about and have them say those words into the mirror — just as Jessica did in the video. You can also start this exercise by doing your own mirror work by saying things like: I love you. I love everything about you. I am great! I am beautiful! I have cool hair! I can dance like a TV star! And then invite the child to join in. 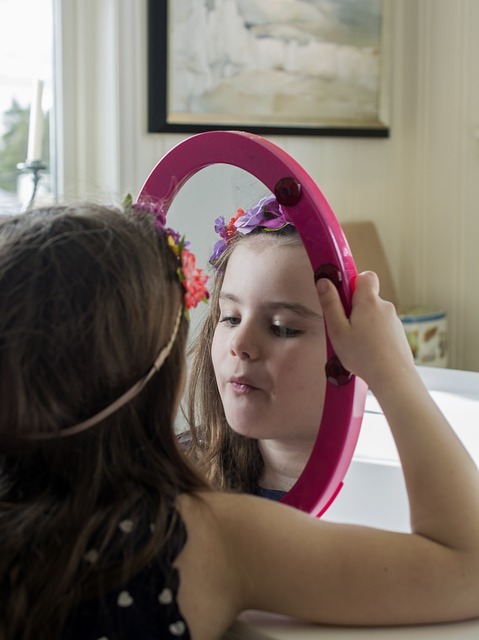 Schedule a time every day to do mirror work with the child, even if only for a few minutes in the morning. Young people are looking up to us and listening to every word we say. Be a shining example of positive statements and affirmations. When you begin to believe them, so will your children. Nurture the children in your life just as you are learning to nurture yourself. Remember: nobody has the “perfect” child or the “perfect” parent. We are bound to make poor choices at one time or another. That is simply part of the learning and growing process. What is important is to love your child unconditionally and, most important, to love yourself unconditionally. Then watch the miracles happen for your children as well as for yourself.